"There is no bad weather, just bad clothing." Vineyards of the Shephelah (Israel). The ruin-mound of biblical Beth-shemesh ("House of the Sun") is in the distance. The Mediterranean World is favored by good weather. Certainly it has its share of rain and thunder and ice and bluster; these are but temporary guests. Its Princeps civitatis is the sun. Brilliant Helios. Sol. Shemesh. Shems. Continental travelers, all too familiar with the "grey days" of home, find this golden orb to be glorious at first, a kind of Valletta lover. In time, it becomes a relationship to be endured, and still later (if not taken seriously) it swells into a glaring enemy. But I get ahead of myself. Perhaps it would be best to start with a generalization, and once that is on the table, poke a hole or two in it. The generalization goes like this: the Mediterranean world has two seasons. These are usually described in binary terms: hot or cool, dry or wet, fierce or gentle. The truth is less dramatic and more regionally nuanced. Summertime attracts the hot, dry, and fierce labels. Of course, it does not become this way suddenly, but starts building in April, crests in August (as in the U.S.), and then winds down throughout October. During these seven months of stability daytime highs swing between 70º F and 90º F, while nighttime lows may drop into the 60º F range. Rainfall is rare to nonexistent in this brittle-brown season, although humidity can be high in montane valleys and along the coasts. In desert zones and inland plateaus, summer temperatures soar to 100º F or more. Such conditions require vigilance: dehydration, sunburn, and other heat related illnesses have conspired against more than a few unwary travelers. From left to right: A cold rain falls on Manger Square in Bethlehem, Palestine; A carpet of snow melts near Pamukkale, Turkey; Raindrops accumulate on a window looking overlooking Salah ed-Din Street, Jerusalem. Wintertime, on the other hand, is cool on the Mediterranean rim. During these five months of instability, daily highs oscillate from 40º to 70º F. Freezing temperatures are possible (and likely) but are short-lived. Rainstorms blow in and out and can be, at times, violent and drenching. Snow accumulates at elevation. Having personally experienced several winters in Israel, Palestine, and Jordan, these months are bone-chilling. The unfortunate combination of masonry structures, lack of proper insulation, and a thrifty landlord's light finger on the thermostat means that it is possible for indoor temperatures to approach outside temperatures! As the study of archaeological sites is almost exclusively an outdoor exercise, explorers who venture forth in the winter months must be prepared to layer on and layer off as moisture, temperature, and activity dictate. These weather conditions are the result of the situation of the Mediterranean World at the intersection of mid-latitude and tropical dynamics. * A driving force here is the seasonal movement of a belt of high atmospheric pressure known as the subtropical ridge (or "horse latitudes"). 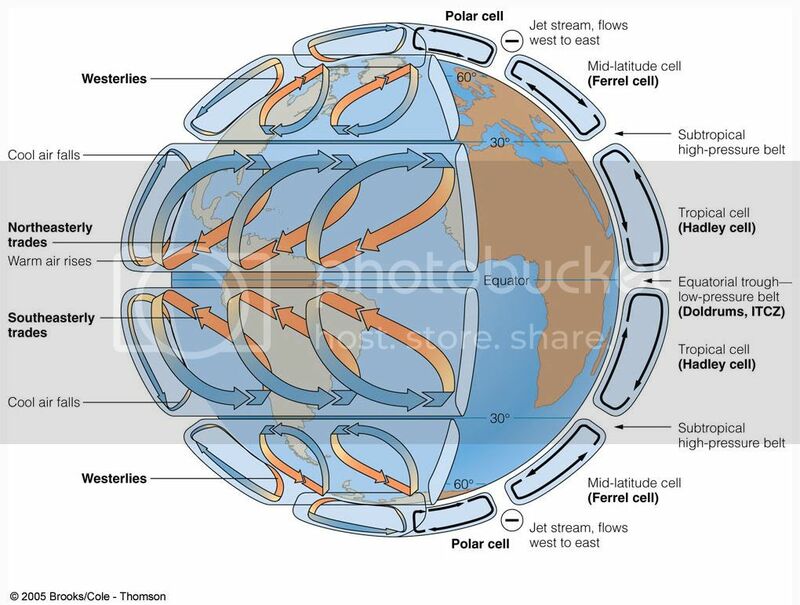 In the summer months, this belt migrates north, pushing air from the North African furnace into the Mediterranean basin. This Saharan high brings clear skies, low humidity, and occasional grains of sand to Bible lands. Precipitation becomes a distant memory (and a local wish!). Haze accumulates, mixes with fog from the sea, and settles in low-lying areas. It hangs on stubbornly and frequently induces curses from photographers seeking the otherwise perfect vista. This summertime pattern of heat and haze is broken occasionally by a Khamsin (Arabic) or scirocco (Italian) wind that circles around from the southeast. This is hardly a relief, however, as suffocating grit fills the sky, turning it to bronze. Animals and locals alike look up and tremble. 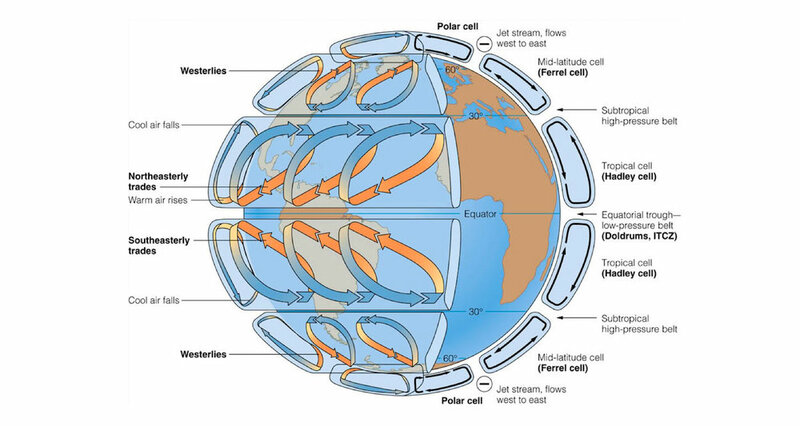 Idealized depiction of large scale atmospheric circulation on earth. Note the location of the subtropical high-pressure belt at 30 degrees of N latitude. Image from here. In winter months (due to the tilt of the northern hemisphere away from the sun), the high pressure belt drifts back toward the equator and away from the Mediterranean region. The release of this grip gives opportunity for more temperate winds to blow in from the Atlantic. These westerlies usher in rain-bearing lows and the occasional cold snap. Nearly all of the annual precipitation that makes life possible comes in these critical months. Biblically, it is the period of "early" and "latter rains." The ancients were in touch with their environment and knew its seasons. Their livelihood depended upon it. Anomalies could be catastrophic and resulted in lost crops, livestock, fortunes, and famines. It is no wonder that biblical text preserves many references to weather. Local deities, pageantry, festivals, and traditions around the Mediterranean were often identified with rain and wind, sun and moon, storm and flood. A map of the Mediterranean Sea with the adjacent regions and seas in Europe, Asia and Africa. Note how mountains ring the basin. Image from here. One might add that mountains also get the better of generalized statements about weather patterns in the Mediterranean World. As rain-catchers and wind-benders, these obstacles alter the distribution of moisture and temperature. Despite proximity, the casual visitor cannot expect the weather of Delphi in Athens, Tel Aviv in Jerusalem, or Boğazkale in Ephesus. This world is anything but flat; the elevational element requires additional thought when packing. The snowcapped Aegean Blocks (Baba Dagh) rise in the sky. Note the palm trees of Pamukkale (Turkey) near our feet. *To investigate these dynamics and then some, see the volume edited by Antonio Navarra and Laurence Tubiana, Regional Assessment of Climate Change in the Mediterranean. Vol. 1, Air, Sea and Precipitation and Water. New York: Springer, 2013. **Fernand Braudel, Memory and the Mediterranean. Translated by Sian Reynolds. New York: Vintage, 2001: 5. Jerusalem (Israel) weather forecast from The Weather Channel. Tel Aviv (Israel) weather forecast from The Weather Channel. Tiberias (Israel) forecast from The Weather Channel. Amman (Jordan) forecast from The Weather Channel. Istanbul (Turkey) forecast from The Weather Channel. Athens (Greece) forecast from The Weather Channel. Rome (Italy) forecast from The Weather Channel.